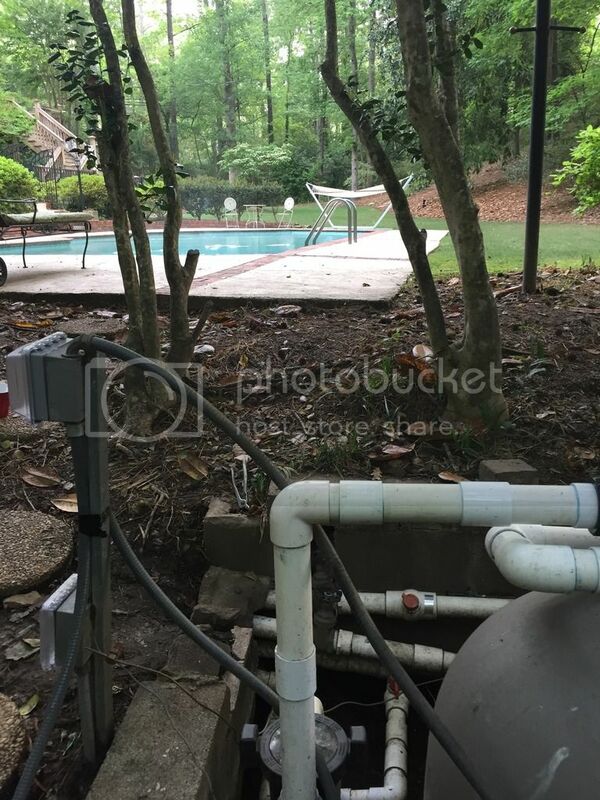 I recently purchased my first home with a pool and am planning on installing a Hayward AQR15 system / check valve / sacrificial anode. I've been reading up on best practices for equipment plumbing become a bit suspicious of some aspects of the existing plumbing and am thinking about re-plumbing the entire pad while I do the salt system install and address some of the pad drainage issues. Before I make too much of a mess, I'm hoping some of you can give me a sanity check on some of the issues / areas for improvement I think I'm seeing. To give some additional context, the pool was built in 1986, the pad is located below water level and had about 18 inches of mud/debris built up around the equipment (pumps and heater are on blocks and above the previous mudline). 1 - Different Sized Suction Plumbingerent size plumbing. 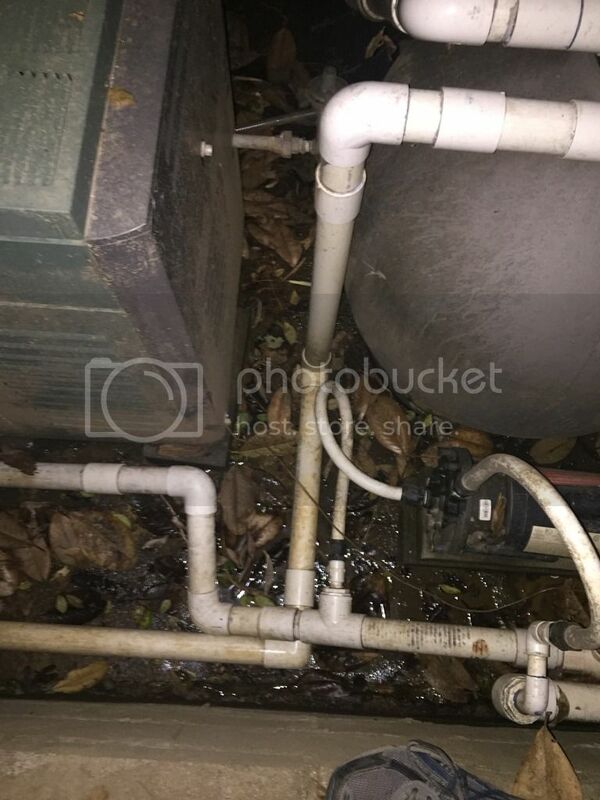 The main drain is 1.5' pvc, while the two skimmers (these appear to be a later addition) are on 2' PVC, before being reduced to 1.5' after the ball valve. - Would there be any downside to running both on 2' PVC to the pump? I'm planning on replacing both valves with Jandy 2-way valves, assuming I have space to move the pump back a bit and get a decent straight away, would it be overkill to also throw a Jandy three way before the pump? All return lines to the pool are 2' PVC. Am I correct in assuming that this plumbing is way more complicated than it needs to be? I'd like to eliminate some of these unnecessary turns. Also - it appears that heater intake line is reduced from 2' to 1.5'.. before being brought back up to 2' at the intake port? While the plumbing for the sandfilter seems normal, I am getting some sand picked up in the polaris each time I empty the bag. The steady-state pressure is 20 psi after being backwashed. I'm assuming the sand is from the high pressure, and the high pressure could be being caused be constricted return flow in the heater plumbing? Just looking at that plumbing, I'd replumb it all. I can't tell exactly how the plumbing and equipment is laid out, but if warranted, I'd even consider rearranging the equipment. As for the heater plumbing, it looks as if they had a different heater initially and replaced it, and the new one had flow opposite of the old one. That bothers me the most of all the pics. If you're relatively sure that the sand you're getting each time with the cleaner is from the filter, you most likely have either a multiport issue or a broken lateral. You'll need to check that out to figure out which it is. Whoa boy, that is some ridiculous PVC work! The heater section seems ripe for some rework and should make incorporating the salt cell into the flow post heater easier as well. Heater has definitely been replaced at some point. Appreciate the advice! I agree with what has been said so far. So many coupling and so few unions. I'd like to add that your electrical wiring going into your heater is a mess, so there are likely other electrical issues too. I would definitely raise the Pad, no need to work in that mess. There are 2 screw metallic type valves that if you are going to use SWG, don't need to be there. You should work all pipe in 2" definitely. +1 on Unions on the pump, heater, SWG, and filter. I would also disassemble the sand filter and inspect for broken parts. The sacrificial anode has been debated a lot and the main conclusion is that is not a necessity you can add it later if you need to. Definitely going to raise the pad now that I'm going to replumb and take apart the sand filter. Thanks for the catch on the old metallic valves - hadn't even occurred to me. Also, make sure you put a check valve after the heater outlet and before it attaches to the salt cell. You don't want any of that highly concentrated salt backtracking into your heat exchanger. You've lost me on this one (maybe I'm thick), but the salt concentration isn't changing pre or post SWG. Yeah there's no point in putting a check valve between the heater and the salt water cell. Everything I've read says to place the check valve between the heater and SWG - purpose isn't salt concentration, but to prevent the high concentrations of chlorine generated by the SWG from backtracking into the heater. Same philosophy behind RayPack saying you shouldn't put chlorine pucks in the skimmer baskets. I guess this falls into the what could it hurt category. Post some pics when you make some progress! The problem with that logic is the SWG does not generate any chlorine when the pump is not running so if it's not generating there's no high concentration of chlorine that can even back up and in any case it's not a very high concentration of chlorine. The only thing that it hurts is adding head loss which lowers your flow rates at a given pump speed. Point noted - would this be an issue with some SWG systems more than others (assuming the AQR is higher quality than other systems)? My RayPack heater had been neglected by the previous owner and I would like to prevent any more damage than what has already caused by the poorly maintained water chemistry. Will do! Trying to get all parts and planning in order so I can knock out in a weekend and not have too much downtime on the circulation. The lack of a need for a check valve between an swg and a heater is not dependent on the brands. There is just no point for it. 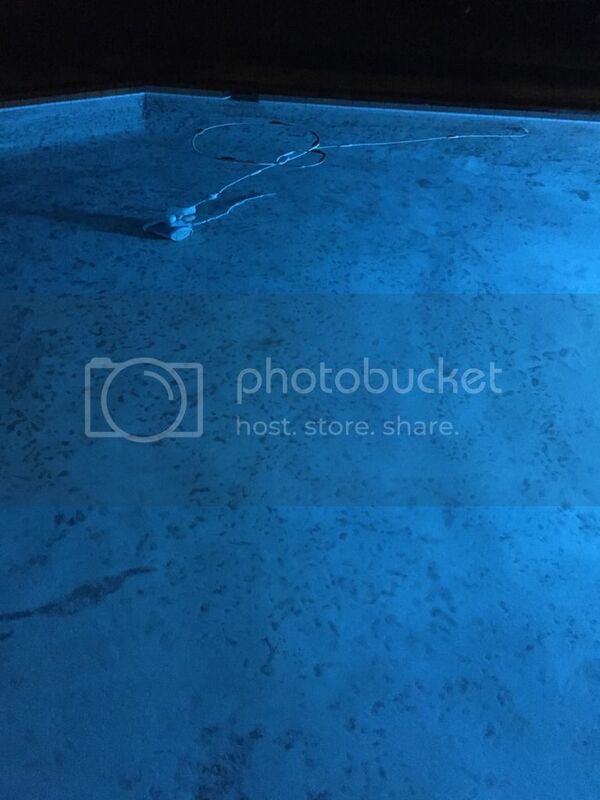 Any ballpark on how long my pool go can without filtration/circulation before turning foul? It's pretty shady most of the time if that has any impact. With downtime in mind, I'm thinking about temporarily taking my Raypak RP2100 gas heater out of the loop so I can reverse the heat exchange in the unit and temporarily move out the way to work on that half of the pool pad. 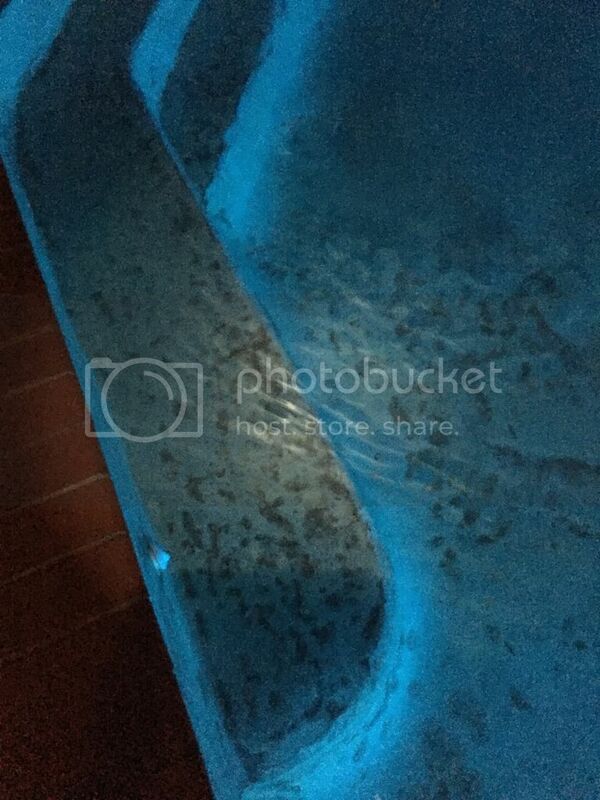 Also assuming it needs cleaning / maintenance given some of the staining in the pool. Does making a connection where the PVC is overlapping (giving a decent run prior to the booster pump connection) look like it would cause any issues? If you keep adequate FC levels in the pool by adding bleach and brushing to mix it in, then the water should stay algae free, but it will get dirty.